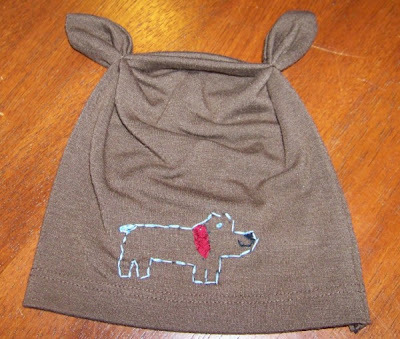 Bouncing Buttons crafts making it simple: My Daughters first wearable sewing project. My Daughters first wearable sewing project. Demi sews a lot. I try to keep her busy with many types of sewing projects. She is now 4 years old and has just finished a project for someone (a baby) to wear. She hand embroidered a dog on some fabric and then sewed the sides and top shut (with a bit of my help using the sewing machine). I am such a proud mama! It is a little doggy hat for my cousin's baby (her baby shower is this weekend). The embroidery isn't perfect Demi made a few mistakes with the outline near the tail and the ear. 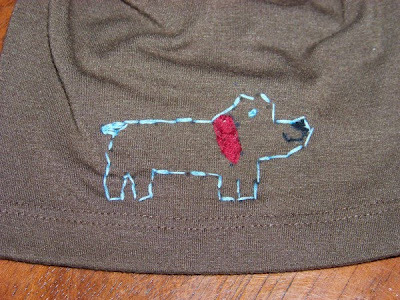 We tried to fix it a bit by adding the mistakes into the design when she stitched the tail and ear details on the dog. I love things that look handmade and this has a very handmade look to it. I am so tempted to keep this and put it on a doll or stuffed animal. (sigh)... This will make it to the shower (even though I really really want to keep it) BUT the next embroidery project Demi makes is going in a frame on my wall!!!! I took pics of her doing this project and I will post them on my homeschool blog I am posting a week in advance on that blog so the pictures should show up by next week. The hat is nothing to make you can find patterns similar to it all over the web. I didn't use a pattern (I made it from a sleeve of a knit shirt). I know the hat isn't an original idea but I might post how I set it up for a young child to make herself. I will try to post how to make this project simple enough for a preschooler to do by the weekend on my tutorial blog I did set this project up a tiny bit different for her than I would have if I was doing the embroidery myself. OK enough of my chatter! Here is the hat! Isn't it very CUTE????? I LOVE IT!!! I think it is beautiful art (considering the artist is 4). Below is a close up of the embroidery. I hope to have my project finished up by tomorrow. My baby shower gift is something that kind of goes with this hat. I hope I get my project done before the shower. Fingers crossed I will have pix to share tomorrow of my project! I think that is adorable and for a 4yo quite an achievement. Imagine what she could do at 8yo!